Think oil changes aren’t important? Think again. • Oil attracts dirt and contaminants. Oil and contaminants can work their way into your engine. Don’t deal with a clog – it can cause so many problems. How does the dirt get into your car’s engine? Though dirt in gas and the breakdown of the interior of car parts such as hoses. Clean oil provides fresh lubricant to the sensitive interior parts of the engine, giving it a long life and excellent mileage and performance. • It takes too long. Believe it or not, an oil change takes just minutes. The expert auto repair technicians at Fairlawn’s Rad Air Complete Car Care and Tire Centers can get you scheduled at a time that is convenient for you and get you back on the road. Taking a few minutes to change your oil every 3000 miles will save you time and money in car repairs. Not sure if you are due? Check your car’s manual to find out how often oil changes are recommended. • Where you drive matters. Though it might be easy to assume that running errands won’t cause issues with your car, you would be wrong. Short jaunts around Fairlawn can cause issues because the oil in an engine doesn’t have time to warm up sufficiently during short trips around the city. When the oil doesn’t warm up, it also doesn’t have time to adequately lubricate the interior of a car engine. 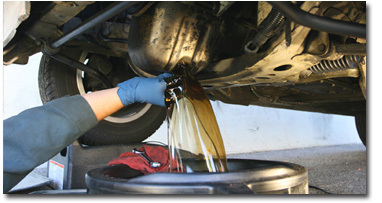 Regular oil changes can make sure that your car’s oil is in optimal condition. Do you have a few minutes every few months? That’s all it takes to get an oil change every 3000 miles. And, this simple service can save you money and hassle in the long run. Contact the Rad Air Complete Car Care and Tire Centers location in Fairlawn, OH to schedule a convenient oil change appointment. Our auto technicians will ensure that your car has clean lubricant ready for your next drive.